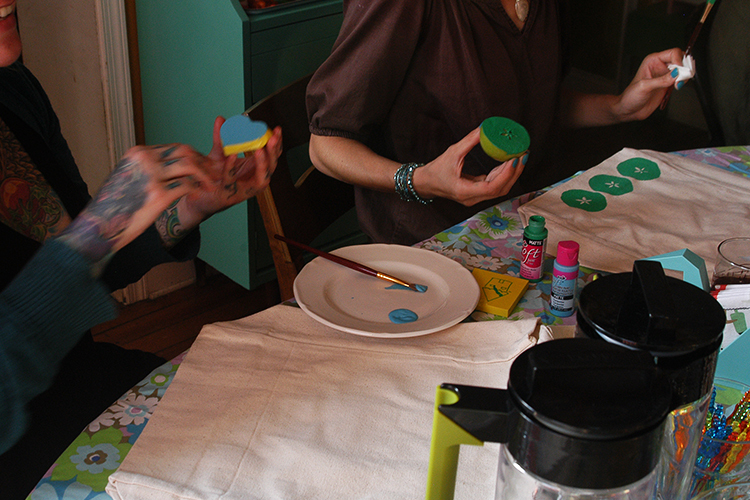 Today’s DIY is super simple, and I think would actually make a great project for a Crafternoon. 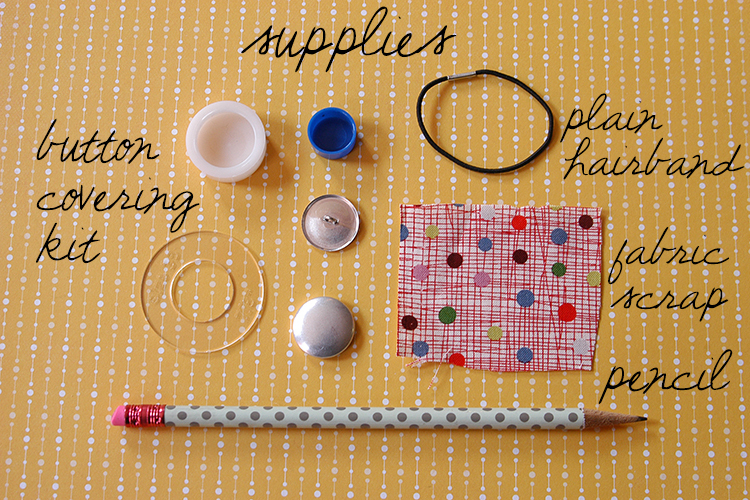 Everyone could bring fabric scraps and once you have one of the Button Kits ,you can buy a few of the refills . This project is also really easy to make with kids! The supplies are easy too.. The button covering kit comes with this little circle tool that helps you to line up your design. You put the tool on the fabric and the opening in the middle shows you what will show on the actual finished button. This makes it great for picking cute elements from your fabric to feature. 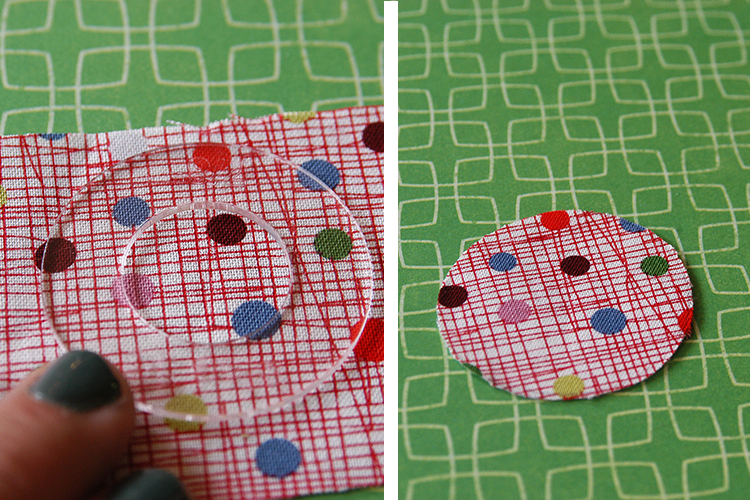 Then trace around the outer edge with a pencil for your cut line, and cut out the circle. 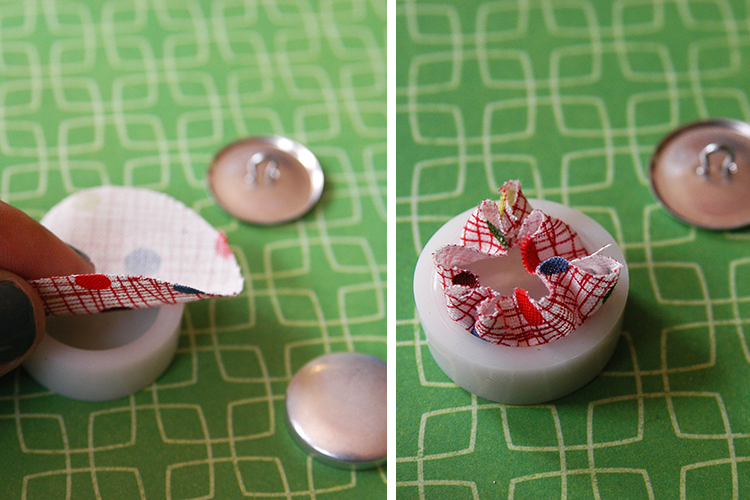 Lay your fabric face down into the plastic button maker that comes with the kit. Then push the flat circle disc into the circle (smooth side down) This forms the front of your button. Tuck all your ends of the fabric in. 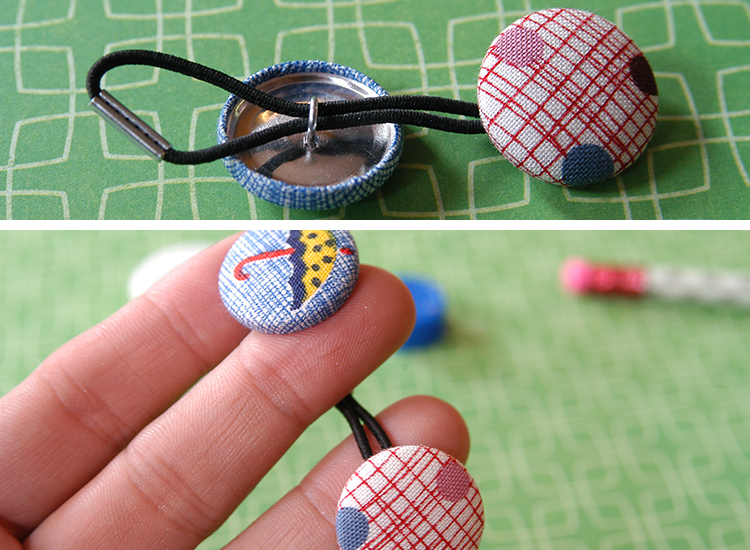 Put on the button back with the hook facing up, and use the blue tool to push it down into the button front. You will feel a snap as it locks into place. You can then remove your button from the button maker and your button is done! It’s so easy and fast! 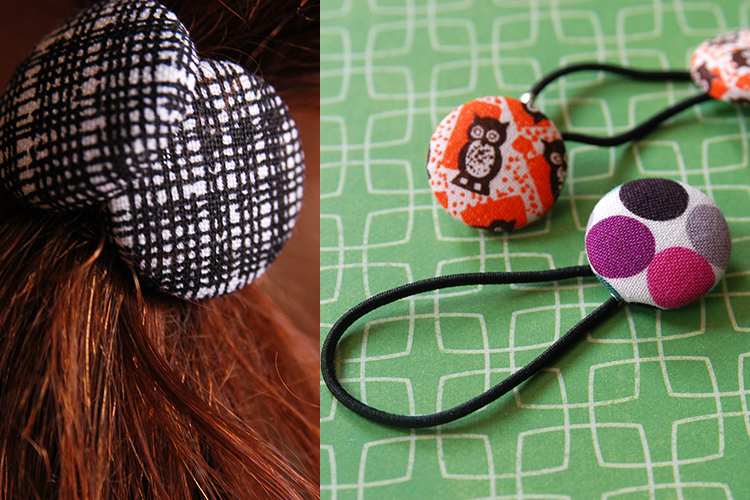 Now insert your hairband into the loop on the back, and bring the loop over the entire button to secure. If you have trouble feeding the hair band into the loop you can use tweezers to grab it, but mine went through pretty easily. You can leave your hairband this way for just one decorative band. Or you can add a second button. 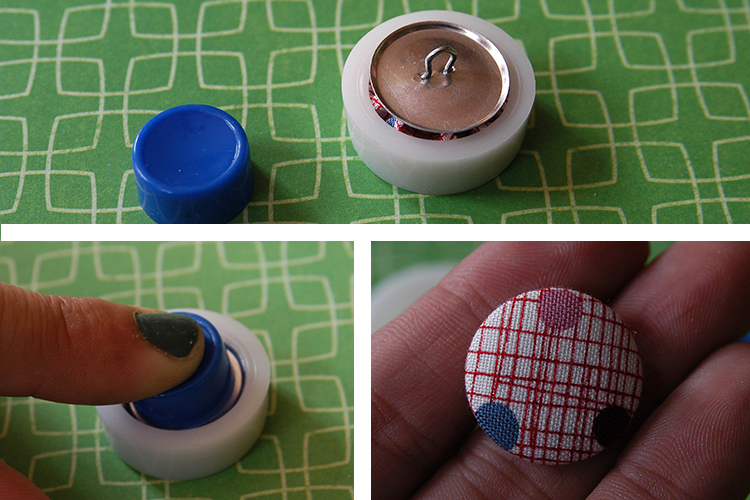 You add the second button the same way, and bring the hair band around the button to secure. Now when you go to tie your hair up, you just hook one button around another to secure. 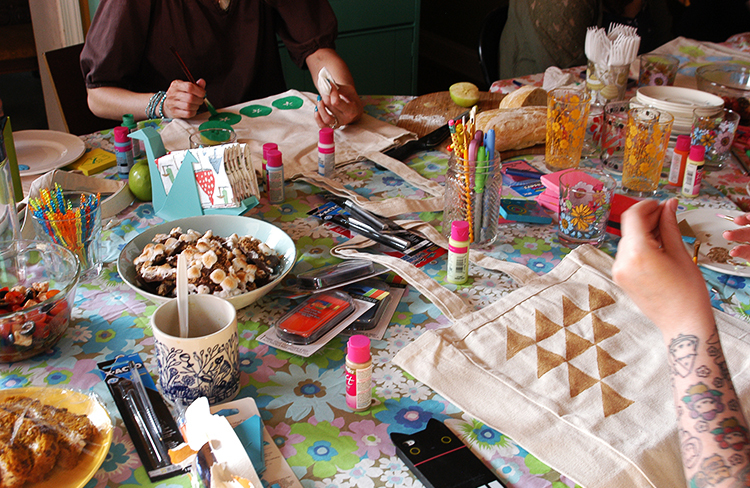 Yesterday I held my July Crafternoon for nine of my lovely lady friends. 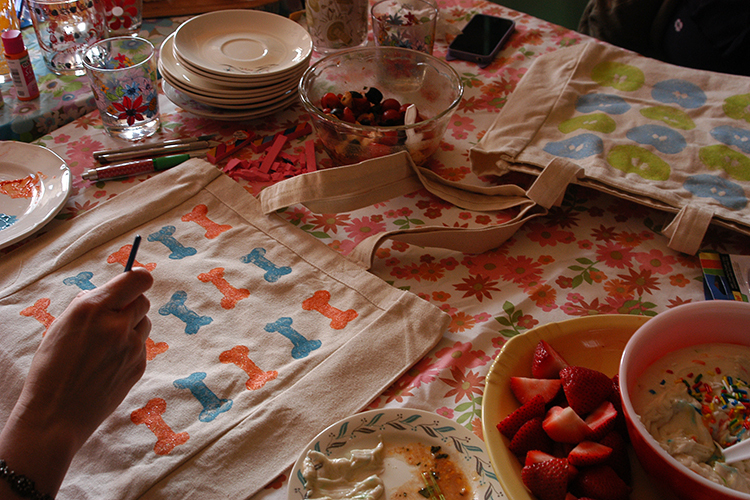 For this one we carved rubber stamps to stamp onto reusable grocery bags. Luckily we only had one finger slice, although I would have preferred no one leave with a wound, it was pretty good considering we used exacto knives. You can see poor Katie with gauze on her finger in these photos. You may also notice she switched to an apple after her injury :( Molly brought the apples for cutting/stamping which was perfect! I made a fake-chicken rice soup even though it’s Summer. Soup is just easiest to feed a crowd, and was easy to make gluten-free for one of my guests. I did however make a gluten filled loaf of no-knead bread, but I’m not sure how to make GF bread so it could of been disasterious if I tried. 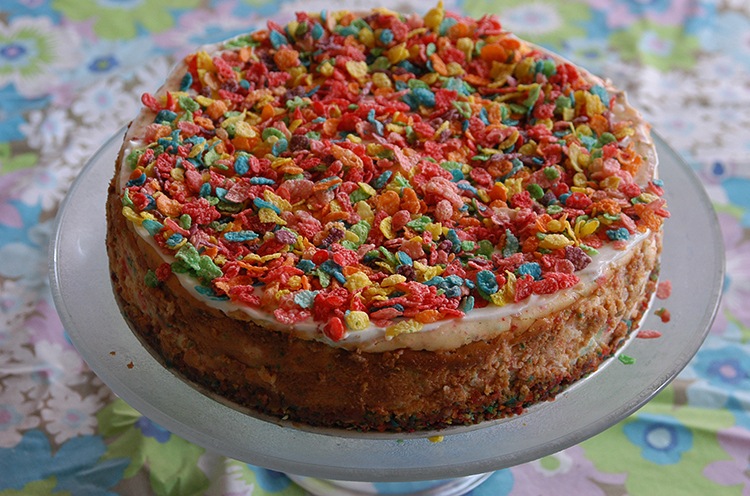 I also made a Fruity Pebble cheesecake because that was easy to make GF. I just used a GF recipe for NY Cheesecake and made the crust from crushed fruity pebbles. Swirled some into the batter and added them to the top. This also disguised the crack that formed quite nicely! 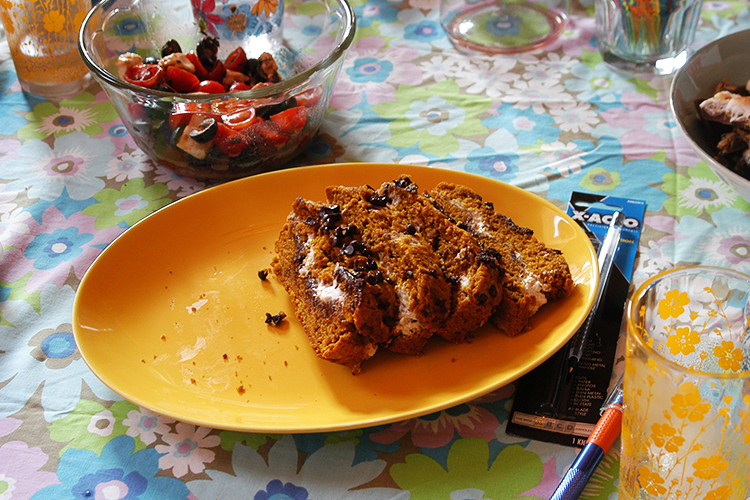 Tasha made vegan chocolate chip/cream cheese pumpkin bread, it was of course amazing. 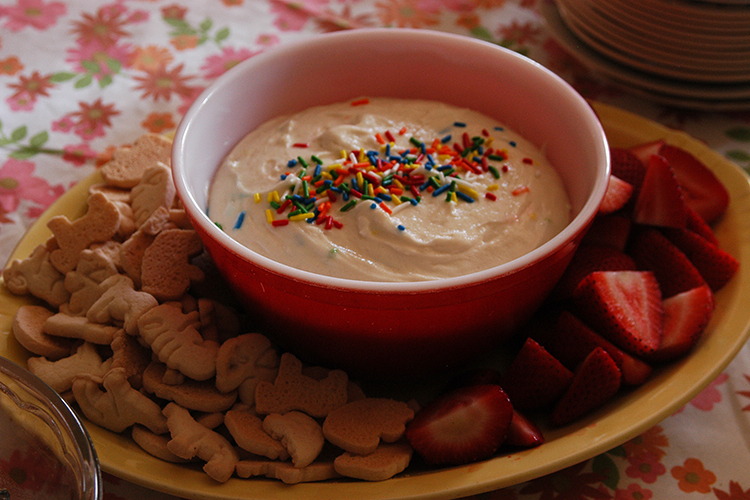 Meri made a salad of tomatoes, mozzarella, and olives…called “snackies” which was perfect to break up the sugar coma, Molly made a cake batter dip for animal crackers and strawberries (yep cake batter dip!) and Paige brought a peach cobbler cake (and the pan was empty at the end of of the night). 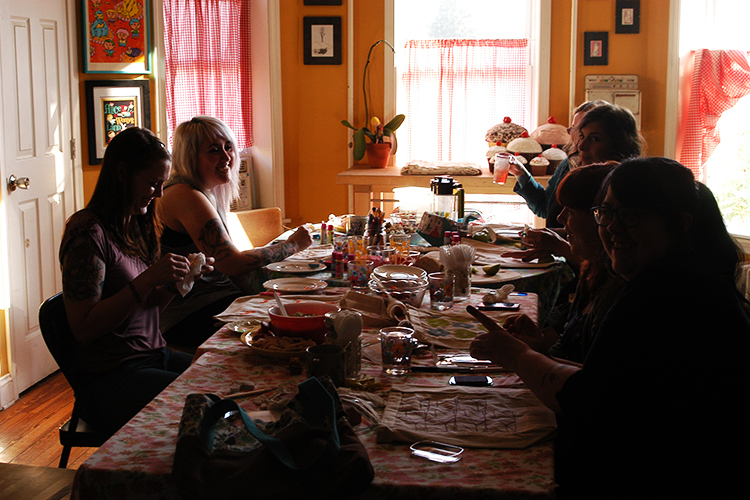 It was so much fun and I can’t thank these ladies enough for coming every month! **Speaking of hand carved stamps did you see the Geninne’s book Making an Impression comes out Oct. 2nd!! She is the queen of hand carved stamps, no question about it! I’m a sucker for the details inside kid’s books. The cute little logos, beautiful end papers! !